The People's Champ Manny 'Pacman' Pacquiao returns to ring to defend his WBO Welterweight title against Chris Algieri on Sunday, November 23 at The Venetian Macau, China. Pacquiao (56-5-2, 38 knockouts) of General Santos City, Philippines and Chris Algieri (20-0, 8 KOs) of Huntington, N.Y. both weighed in officially under the 144-pound catchweight on Saturday morning (November 22). As boxing’s eight-division world champion with an astounding record of 56 wins, and five losses with three knock-outs, Pacquiao is an early bet to win against newcomer Algieri, dubbed by netizens as the ‘heavy underdog’ despite his record of 20 wins with eight knock-outs and 0 losses. Algieri may have the height and reach advantage with his 5-feet-10 stance and maximum reach of 72 inches but professional referees and analysts believe this figure will not hinder the Filipino champ’s speed and foot work. Pacquiao stands 5-feet-6 in height and has a maximum reach of 67-inches. The Pacquiao vs Algieri fight dubbed as "Hungry for Glory" is available on livestream channels and HBO PPV. It is also available on Blink-Now.com for only P199. 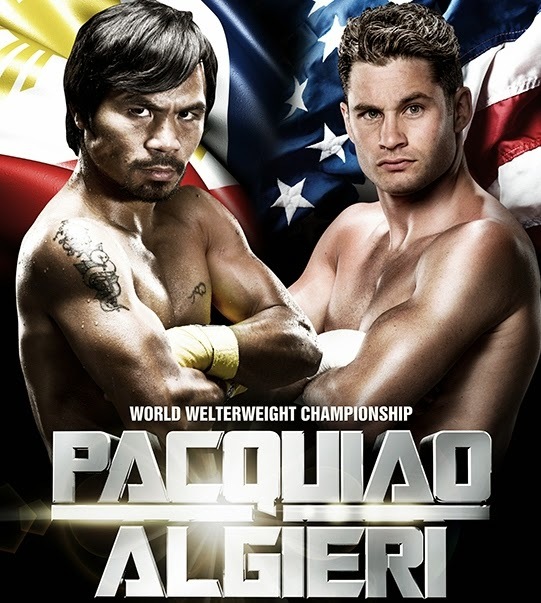 You may also watch the Pacquiao-Algieri fight clear and live via konansports.com.